Gabrovo (Bulgarian: Габрово) is a city in central northern Bulgaria, the administrative centre of Gabrovo Province. It is situated at the foot of the central Balkan Mountains, in the valley of the Yantra River, and is known as an international capital of humour and satire (see Gabrovo humour), as well as noted for its Bulgarian National Revival architecture. Gabrovo is also known as the longest city in Bulgaria, stretching over 25 km along the Yantra, yet reaching only 1 km (0.6 mi) in width at places. The geographic center of Bulgaria - Uzana is located near the city. According to the most widespread legend, Gabrovo was founded by a blacksmith called Racho, close to whose fireplace a hornbeam rose, so the settlement acquired its name, from the Slavic word gabar ("hornbeam") + the Slavic suffix -ovo. The area around Gabrovo, inhabited since the Neolithic, gained economic importance after Veliko Tarnovo became capital of the Second Bulgarian Empire in the 12th century. Craftsmanship and trade prospered due to the proximity to both the capital and the Balkan passes. Medieval Gabrovo was a small pass village of about 100 houses. After the Ottoman invasion of the Balkans in the 14th century, the demographic position of Gabrovo changed significantly, as it was the only settlement in a considerably large geographic area and an attractive place for Bulgarians fleeing from the conquered capital and neighbouring fortresses. It turned from a village into a small town (palanka) and began to develop as an economic, cultural and spiritual centre. During Ottoman rule, the rich tradesmen spent plenty of resources for the small town's public planning. The first Bulgarian secular school, the Aprilov National High School, was founded in Gabrovo in 1835 with the aid of Vasil Aprilov and Nikolay Palauzov. Gabrovo was officially proclaimed a town by the Ottoman authority in May 1860. In the 1870s Felix Kanitz said that Gabrovo is "a big workshop" and that it is a "city that lives from the water," referring to widely used water power. The glory of the goods of Gabrovo became known throughout the Ottoman Empire, and beyond that, in Bucharest even nowadays there is a street named "Gabroveni". Shortly before and after the Liberation of Bulgaria in 1878, Gabrovo developed as a centre of industry on the basis of its economic traditions. Joint-stock companies emerged, factories were constructed and connections to the large stock exchanges were created, prompting some to label the city "The Bulgarian Manchester". Gabrovo saw its most rapid growth in the post-World War II years, when its population was doubled. Following general population trends in Bulgaria, the number of citizens started declining after the fall of Communism in the country. People started emigrating abroad or to the capital of Sofia. 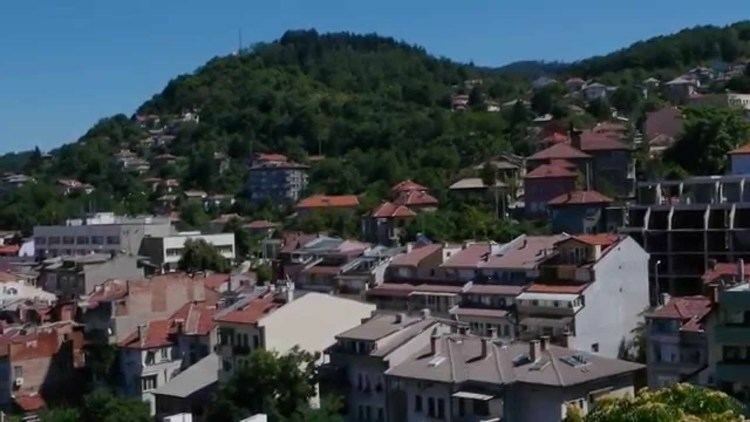 Currently, Gabrovo is more than 20,000 people short of its peak, achieved in the period 1985-1991 when the number of the residents exceeded 80,000. The following table presents the change of the population after the liberation of the country in 1887. According to Census 2011, as of February 2011, the population of the city was 58,950 inhabitants. 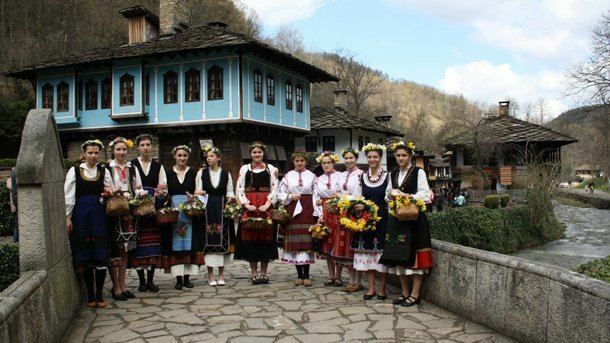 The ethnic composition of Gabrovo Municipality is 60,207 Bulgarians, 504 Turks and 367 Roma among others. Internationally known as a centre of humour and satire, Gabrovo has two theatres, the Racho Stoyanov Drama Theatre and the puppet theatre, a House of Humour and Satire that serves as a cultural institute, a centre, museum and gallery to popularise comic art. There is also a cinema, Aleko Cinema, and a number of museums and memorial houses both in the town and around it, most notably the Etar Architectural-Ethnographic Complex and the National Museum of Education at the Aprilov National High School. A planetarium is also in operation. Gabrovo historian Dr. Petar Tsonchev estimated there were more than 150 types of traditional knives. Places of interest in Gabrovo include the House of Humour and Satire and Aprilov National High School. 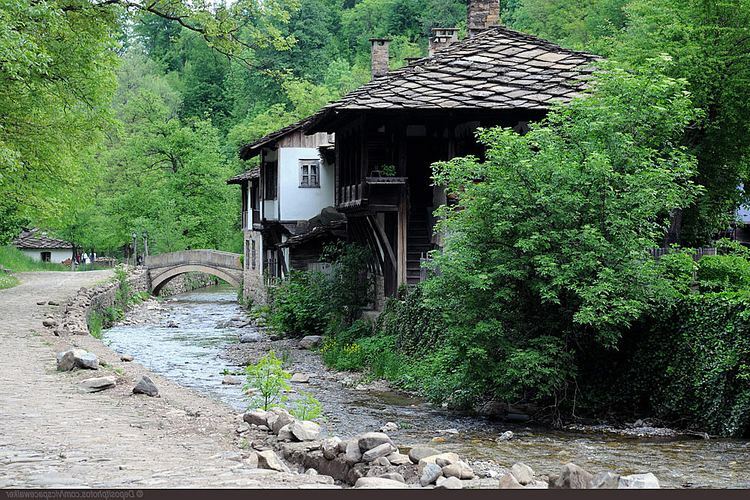 In Gabrovo Province sites include architectural reserve Bozhentsi. Hiking is widely available in the Central Balkan National Park and in the Bulgarka Nature Park, itself home to Ethnographic Complex Etara, Dryanovo Monastery, Sokolski Monastery, Shipka Pass, and the Uzana area. For admirers of historical tourism Shipka Memorial is a must-see. City's most successfully sports club is FC Yantra Gabrovo, which was founded in 1919. The city also has long handball traditions. About 25 km (16 mi) from the city in Central Balkan Mountains is located the renowned winter resort Uzana. A minor planet 2206 Gabrova discovered on April 1, 1976 by Soviet astronomer Nikolai Stepanovich Chernykh is named in honor of the city. Gabrovo Knoll on Livingston Island in the South Shetland Islands, Antarctica is named after Gabrovo. Gabrovo has one of the biggest technical universities in Bulgaria, the Technical University of Gabrovo. The technical university in Gabrovo opened in 1964. The idea for the university came from the 1840s. Today the university has about 5400 students; around 60 of them are from other countries.